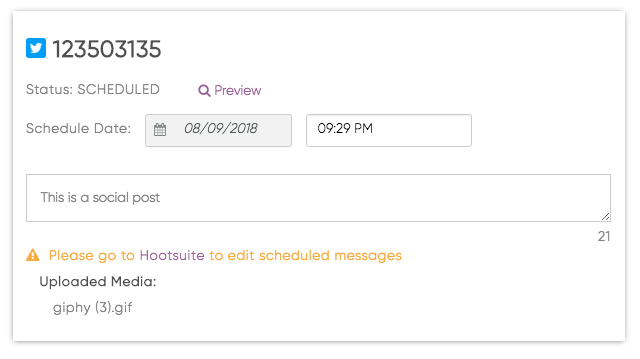 Once you have setup the Hootsuite integration, you can schedule posts in Hootsuite from Mintent. Create your calendar item as usual by clicking a day in the calendar, or clicking Create+. Select the content type Social – Hootsuite. This content type will automatically be added to your account when you set up your Hootsuite integration. Click save. Set up your calendar item as usual in the creative brief. When you’re ready to schedule click the menu option in the creative brief Social Publish. From this page you will be able to select all the social accounts you have in your Hootsuite account. Please note that due to restrictions within Hootsuite, any Twitter accounts will show up via the account ID. Please note that HootSuite does not allow to publish to personal Instagram profiles and only Instagram for business. 5. Schedule and write out the content for your social posts. Please note that you can only use one image for a post. If you attach multiple images to a Twitter post, for example, it will only use the first image uploaded. Preview Button: Allows you to preview the scheduled post. Currently the preview is only available for Twitter, LinkedIn and Facebook. 6. Click Schedule Message or Schedule All Messages. Once you schedule you will not be able to edit the message in Mintent. You will need to go into your Hootsuite account to adjust it. For Twitter accounts, it shows the account ID because Hootsuite doesn’t send the twitter account name back.